James Cordier had piled into a risky position in natural gas derivatives without hedging to prevent steep losses, and when natural gas spiked 18 percent last week, the losses mounted. OptionSellers sent customers an email entitled "Catastrophic Loss Event" saying that all their money was lost, and they could owe even more to another firm to cover margin calls. Jason Albin, a lawyer in Ohio, says he has talked to several OptionSellers clients who are retirees and have lost hundreds of thousands if not millions of dollars. In the video, a money manager named James Cordier tells his 290 clients that he couldn't navigate a "rogue wave" that hit as oil and natural gas markets gyrated severely. His voice shaky and halting at times, Cordier delivered the rambling message while sitting at an uncluttered desk, wearing Wall Street's standard-issue suit, cuff links and wristwatch. "You are my family and I'm sorry that this rogue wave capsized our boat," he says in the video, making a string of nautical references. "I am so sorry for not managing our ship and keeping her afloat." But an Ohio lawyer who has talked to several customers of Cordier's firm, OptionSellers.com, said the trader had piled into a risky position in natural gas derivatives and that he did so without hedging to prevent steep losses. The position was complicated but, in essence, a sharp increase in natural gas prices would mean investment losses for Cordier. And that's what happened. 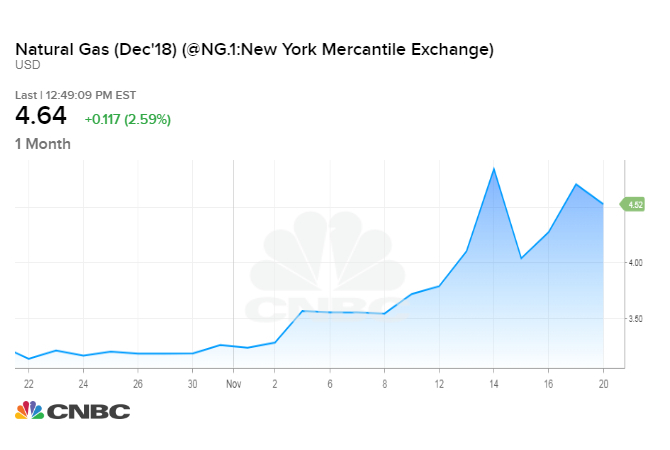 Natural gas spiked 18 percent on Nov. 14. On Nov. 15, OptionSellers sent customers an email entitled "Catastrophic Loss Event" saying that all their money was lost, and they could owe even more to a firm called INTL FC Stone, which handled the trades for OptionSellers. The unwinding of Cordier's position in natural gas derivatives was "so fast and intense that it overwhelmed all risk measures in place," according to the website of Cleveland law firm Chapman Albin, which quoted excerpts from the email. In a statement on Wednesday, INTL FC Stone acknowledged "unprecedented volatility" in natural gas markets last week that caused "liquidity stress" for some of its customers. "Although well collateralized, accounts managed by a Commodities Trading Advisor, Optionsellers.com, had to be liquidated as a result of these moves," the statement said. "Liquidation of these accounts was in accordance with our customer agreements and our obligations under market regulation and standards." OptionSellers' website and online profiles have been taken down. A representative for OptionSellers told CNBC in response to an inquiry, "in regards to this matter, this is our clients' private business. We are in communication with them." Cordier spent several minutes of the video apologizing to individual clients for everything from missing out on bass fishing with them to no longer being able to visit them on the French Riviera. He owes someone a Cuban sandwich, he said, and thanked another client from Kansas City for the barbecue sauce. To another client, who is a big hockey fan, he said, " All I wanted to do was sit with you and watch a game. Next time I'm at the arena, I know you'll be there and I'll pretend that i'm sitting next to you."